The watch brand Tudor and Ducati have just renewed their partnership for the third year. 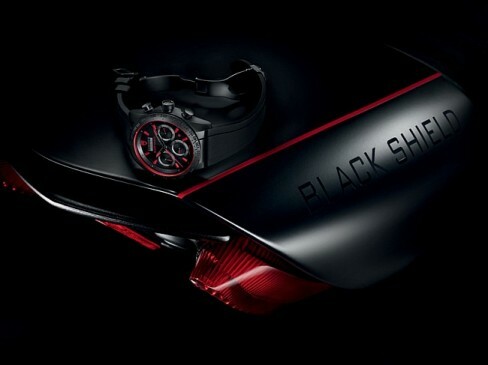 the binomial has presented a Diavel with special decoration to accompany the launch of the latest Swiss chronograph: Fastrider Black Shield. The most important fair of watches and jewelry in the world, Baselworld in Basel, is taking place this week and continues to present curious motorcycle that exemplify the agreements of collaboration of different brands of motorcycles with the most prestigious watchmaking. We knew the original Harley-Davidson Bell & Ross B-Rocket, today turn to the careful Ducati Diavel Black Shield. The bike bears the name of the last chronograph range of Tudor Fastrider, the Black Shield, equipped with a hermetic monobloc ceramic case, caliber 7753 automatic charging, power reserve 46 hours and buttons inserted in the left-hand by cylinders of black PVD that emulate the Pistons of an engine. The base used for this special version (never reach stores) is not the Diavel 2014 recently presented, but the model of last year. The customizer Roberto Totti has used a special black matte paint with graphite uniform for all parts (even the brake calipers) which refers to the color of the ceramic watch, accompanied by a threaded red tires, tank and front, as needles and clock rates. Assemble escapes with silent in carbon fiber, same material as the rear fender and seen the shield logo Tudor in the keel and the tank. The rear-view mirrors and the number plate have been removed for aesthetic reasons. The headlight is smoked front and mounted a strip of red led.